The Advanced Configuration and Power Interface (ACPI) specification describes a number of interfaces that are vendor specific. These include both the concept of the “Function Fixed Hardware” (FFH) interface, which was introduced in revision 2.0, as well as vendor-specific ACPI namespace object definitions. For specific interfaces, ACPI allows a functional equivalent interface to be declared... and implemented via vendor specific hardware registers along with vendor prescribed software manipulation of these registers. It is the vendor’s responsibility to convey the interface’s register descriptions and required software manipulation to operating system vendors to gain the correct implementation and support of any feature in a target operating system. 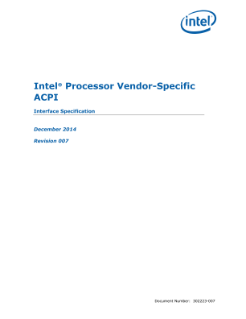 This document describes Intel platform specific ACPI FFH and namespace object interfaces. This document assumes that the reader is familiar with the interfaces defined by the ACPI 3.0 specification. See http://www.acpi.info for more information regarding ACPI 3.0. The optional _PDC (Processor Driver Capabilities) object is a control method that communicates OSPM’s processor power management capabilities to the platform. OSPM evaluates the _PDC object before evaluating other objects within the processor object’s scope. As such, OSPM’s capabilities conveyed by the _PDC object can impact the result of other processor object evaluations. A common example of this is in the platform’s exposure of an FFH interface enabling native Processor Performance State transitions via the _PCT object only when OSPM conveys this support capability via _PDC. This _PDC method is evaluated once during processor device initialization, and will not be re-evaluated during resume from a sleep state transition. The platform must preserve state information across S1-S3 sleep state transitions. OSPM capability bits are defined within the third DWORD of the DWORD argument buffer passed into to the _PDC control method.